Western blot analysis of extracts from HeLa cells, transfected with 100 nM SignalSilence® Control siRNA (Unconjugated) #6568 (-) or SignalSilence® BIN1 siRNA I (+), using BIN1 Antibody #13679 (upper) or β-Actin (D6A8) Rabbit mAb #8457 (lower). 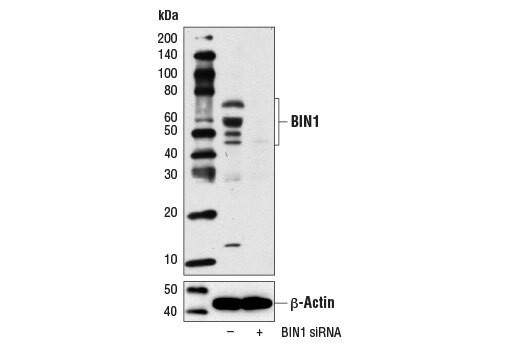 The BIN1 Antibody confirms silencing of BIN1 expression, while the β-Actin (D6A8) Rabbit mAb is used as a loading control. CST recommends transfection with 100 nM SignalSilence® BIN1 siRNA I 48 to 72 hours prior to cell lysis. For transfection procedure, follow protocol provided by the transfection reagent manufacturer. Please feel free to contact CST with any questions on use. SignalSilence® BIN1 siRNA I from Cell Signaling Technology (CST) allows the researcher to specifically inhibit BIN1 expression using RNA interference, a method whereby gene expression can be selectively silenced through the delivery of double stranded RNA molecules into the cell. All SignalSilence® siRNA products from CST are rigorously tested in-house and have been shown to reduce target protein expression by western analysis. Bridging integrator 1 (BIN1, AMPHL) is an adaptor protein and putative tumor suppressor expressed as multiple isoforms due to alternative splicing. The BIN1 protein was originally identified as a Myc box-interacting protein with structural similarity to the synaptic vesicle protein amphiphysin (1). BIN1 protein structure contains an amino-terminal amphipathic helix and a BAR domain that is involved in sensing membrane curvature. The protein also includes a Myc-binding domain and a SH3 domain, which are implicated in protein-protein interactions (1). Multiple BIN1 isoforms range in size from approximately 45 to 65 kDa, with the nuclear BIN1 isoform found mostly in skeletal muscle and the cytoplasmic IIA isoform expressed in axon initial segments and nodes of Ranvier of the brain (2,3). Corresponding BIN1 gene mutations and incorrect splicing can lead to impaired BIN1 membrane-tabulating and protein binding activities, resulting in development of autosomal recessive centronuclear myopathy and myotonic dystrophy (4,5). Genome-wide association studies link the BIN1 gene with late onset Alzheimer disease (AD) and increased BIN1 mRNA expression is seen in AD brains (6,7). Sakamuro, D. et al. (1996) Nat Genet 14, 69-77. Ge, K. and Prendergast, G.C. (2000) Genomics 67, 210-20. Ramjaun, A.R. et al. (1997) J Biol Chem 272, 16700-6. Nicot, A.S. et al. (2007) Nat Genet 39, 1134-9. Fugier, C. et al. (2011) Nat Med 17, 720-5. Seshadri, S. et al. (2010) JAMA 303, 1832-40. Chapuis, J. et al. (2013) Mol Psychiatry 18, 1225-34.